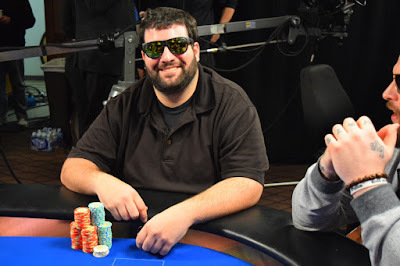 Michael Comisso moves all-in preflop, Chris Busch folds, and Danny Gonzales snap-calls faster than any of you can open a refrigerator door when you REALLY need a beer. Comisso is at risk for his 1.8 million stack. The flop is 2-J-4, an 8 on the turn, but Comisson is gone when the A♥️ hits the river, and Gonzales breaks into a big celebration with his rail of fans in the front row. Gonzales has eliminated the first two players of the day.